It’s Sam’s turn to get in on the Magic 2012 action, and she’s selected Sacred Assault as jus tthe deck she’d like to champion. A good thing, too, as so much of Mystical Might relies on taking to the air. With both decks marshalling a solid air force, it’s going to come down to the supporting cast of creatures and cards, as well as solid play and the occasional mise to see it through. Will the Illusion and Soldier ground troops have what it takes to hold off the Green/White challenger? Here are the notes from the match. Sam leads us off with a Plains and passes, while I land a turn-1 Phantasmal Bear off of an Island. Sam pairs her Plains with a Forest next turn but has no other play. Once my main phase rolls around, I, too, have both colours of my manabase represented, and swing in for 2 with the Bear. Sam’s turn-3 Griffin Sentinel gives her her first body on the battlefield. Back to me, I attack again for 2, which Sam- perhaps smelling a trick- lets pass. I follow up with a Skywinder Drake and end the turn. Next turn Sam swings for 1 with the Sentinel, opening herself up for a 5-point swing in return from my beaters. She’s already down to 11, and things aren’t looking much better as I play a Benalish Veteran. Things do turn around for Sam a bit on turn 5 when she girds her Griffin with a Spirit Mantle. She attacks for 2, taking me to 17 life. Over to me, I play a Siege Mastodon and pass, having no profitable attack. Sam adds to her Griffin array with an Assault Griffin, chunking me away for 2 life with the unblockable Sentinel. Looking to press the issue, I swing back with everything- an 11-point assault. Sam blocks the Mastodon with the Sentinel, and accepts the trade of the Assault Griffin for the Skywinder Drake. My Bear and Veteran get in for 5, taking her to 6 life. I play a second Phantasmal Bear and pass. Now turn 7, Sam attacks again for 2 with the Sentinel before she picks off one of my Bears with a Pacifism, killing it. She tries to follow up with an Auramancer to retrieve the Pacifism, but that’s just greedy- I Cancel the summons. Back to me, I send in the troops again, looking to keep momentum going. The Sentinel again blocks the Mastodon, leaving Sam at 1 life. Sam hopes to draw a solution, but even after playing a second Auramancer to return the Pacifism and neutralise the Armodon, there’s just not enough to stop me from winning. I’m off to a slow start this go-round, with my first creature a turn-3 Benalish Veteran. Meanwhile, Sam has menaced with a pair of Griffin Riders. Nonthreatening 1/1’s on their own, they’ll essentially become a pair of 4/4 hasty fliers the moment her first Griffin lands- and she had two in the last game. Sam’s turn-4 Mesa Enchantress offers up synergy with the other component of her deck- auras- and I’m going to need an answer soon. I swing for 3 with the Veteran, then play a Skywinder Drake. Now turn 5, Sam attacks for 2 as I have no blockers free, leaving us tied at 17 life. I swing in for 6, then follow up with a second Skywinder Drake. Next turn we continue the back-and-forth slugfest with Sam getting much the worse of it, and my three-creature swingback carves her down to 2 from 9. Sam looks to have a breakout play on turn 7. She first casts Pacifism on the Benalish Veteran, which allows her to draw a card off of the Enchantress. As luck has it, it’s a Peregrine Griffin! Hallelujah, Sam is saved! Or not… I Cancel it, and crush her next turn. Sam and I both get off to an aggressive start here. I land a turn-1 Phantasmal Bear. Sam nets a turn-2 Griffin Rider, while I play a Coral Merfolk after a 2-point attack. This time, Sam manages to find the Griffin for the Rider on turn 3, and it plows into me for 4. Aside from an Island, my turn is a blank. Now turn 4, Sam sends in both Griffin and Riders taking me to 11 life before playing a second Griffin Rider. My turn is again a blank. Next turn Sam swings in with the team after putting Trollhide on one or the Riders. To bring the Griffin Riders down to size I respond by Unsummoning the Griffin Sentinel. Deprived of their buffs, the Riders are much easier to deal with now, and one of them gets eaten by my Phantasmal Bear. The other- the one with the aura- gets through for 3, leaving me at 8 life. Over to me, I play an Aven Fleetwing and pass. The Unsummoned Griffin returns on turn 6, and Sam sends in the restored Griffin Rider for a 6-point attack. I take a calculated risk and decline to chump with the Aven (going down to 2), and it ends up paying off as I topdeck an Oblivion Ring to solve the threat of the Griffin Rider once and for all. Next turn Sam adds a Peregrine Griffin and passes. I drop a Serra Angel. The tide seems to have turned. Sam has nothing on turn 8 outside of a Plains, while I add a Phantasmal Dragon to the board. Sam’s turn 9 is another blank as she fishes for answers from the top of her library and comes up with nothing. 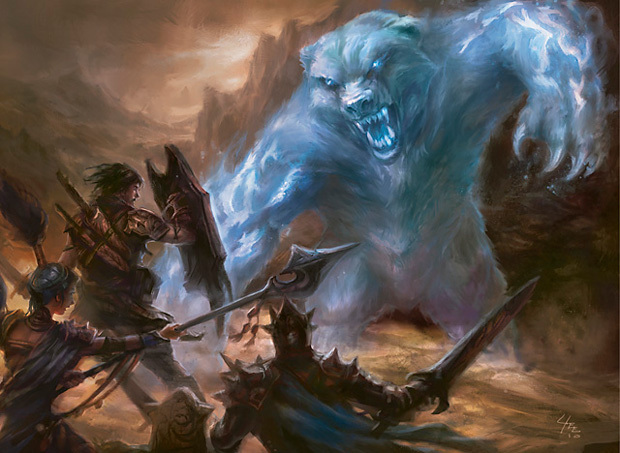 I play the Sphinx of Uthuun, revealing an Unsummon, Negate, Phantasmal Bear, Skywinder Drake, and Benalish Veteran. Sam doesn’t need long to sort the piles knowing she’s nearly doomed regardless, and I take the smaller pile with the Unsummon and Drake. Although Sam manages to slay the Dragon with a creative use of a Divine Favor, there’s little she can do to salvage her position and the game ends in a sweep. 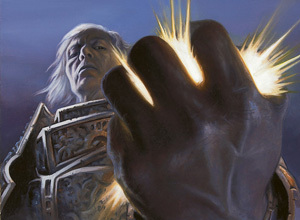 In our deck analysis, we concluded that Mystical Might had a ‘rather bland and generic feel to it.’ Although we didn’t see anything that turned our mind fully around, it must be noted that the deck seemed to have a little more focus and efficacy than some of its contemporary Blue/White skies decks. More than that, it was surprisingly fun to play (at least for three games)- particularly the deck’s MVP for the above match, the Skywinder Drake. To be fair to Sacred Assault, all it would have taken to blitz me into oblivion in the middle match was a single Griffon, so there I was as much lucky as good (so to speak). 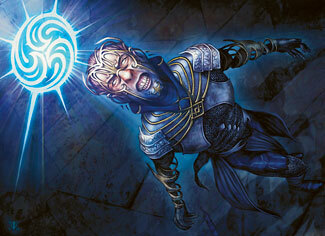 Mystical Might is not without its weaknesses, and the paltry removal package is one of them. Two Oblivion Rings are a solid start, but unless you’re able to counter it being cast, you’re not going to have much success in permanetly solving a creature threat outside of the red zone. Because it is yet another take on the classic skies archetype (albeit with an Illusionary twist), it’s hard to recommend Mystical Might on the basis of novelty. But if you haven’t played a skies deck before, or you’re a fan of the strategy, you could do a lot worse. Nice matches! It seems the skywinder drake isn’t as bad as i thought, in fact, he seems a fairly good threat for its cost. I like the illusions of the deck, but i agree with you that the deck feels a bit generic. About the removal suite, two pacifisms wouldn’t have hurted. He was a pleasant surprise… I started really enjoying when the Drake would appear in my hand. Although he’s one mana less than the Impaler Shrike, it seems to make a lot of difference. Extra cards or no, I was never fond of paying four mana for a 3/1, but it seems okay to pay three. I hate to play devils advocate, but I disagree that this is a generic theme deck. I thought it was to…, that is, until I bought it.I think that the illusions bring enough to the table to change the whole feeling of it. just my opinion, open to debate. A deck’s winning and losing is just one of a number of things that go into a rating, and it carries less bearing than you might think. After all, there are two decks at the table, and if the other deck doesn’t play out well (or is just a bad deck), it doesn’t necessarily mean that the other deck is ‘good.’ We look more for how deck deck won- did it have solid gameplay, consistent answers to problems, sound strategy and tactics, and, yes… was it fun to play. Hexproof I do like. I enjoy playing with shroud. What would be the best of the 2012 intro packs for a complete nivece to get? Hey mate, thanks for the question, it slipped right through the cracks. I’d say that the M12 decks are all fine for a novice- it really depends on what colours you tend to like better than others. None of them are intricately complicated, making them the simplest of any given year’s precon offerings. I have Mystical Might and its the most fun deck I have ever used. With it I totally dominate my friends (which are mostly greens and reds that have little to no flying creatures). I also find the illusions quite useful.